I know it’s been a long time since my last post, and I did mention in a previous post that I would be trying Linux as my main OS. Here is the result of that latest attempt – Linux Mint. It is a distro that is based on Ubunutu, but provides more “out of the box”. (Funny that term sticks when there is no box.) It provides the ability to play DVDs and other media. But I also find it’s a bit more than Ubuntu + codecs. This distro has some tweaks to the Gnome UI that make it more uniquely theirs. Upon first login, you will see one instead of the more traditional two Gnome toolbars, and they have included a Linux Mint Menu, which is a bit more streamlined. It has Places and System on the left, and to the right are the Applications, sorted by category. I chose to dual boot this with Windows XP. If Linux is to be my main OS on this box, then really the only thing I would use Windows for is a handful of games I like to play occasionally. So a VM would not work well in this situation. When installing Linux Mint into the spare room on my hard drive (I had installed Windows into a partition a little less than half the size of the total 300GB), it found Windows without issue and added it as a menu entry into Grub. Another nice thing Linux Mint has is a graphical based Grub by default. Once the install was complete, the first boot of Mint had a quick first time configuration utility. It allowed for the enabling of the root account (disabled by default in Ubuntu), for those that like the more traditional *nix approach. Although even if root is enabled, when you do any administrative tasks, it still does so by sudo, so the password it prompts for will be your user account’s password. The enabling of root will allow for login as root, or to change to root in terminal (su –). Of course, the same thing can be accomplished in Ubuntu by doing a sudo passwd root in the terminal. Also in the utility, you can turn off Mint’s “fortune cookie” like sayings that will appear when opening a terminal, similar to a motd. Some will draw a chuckle, but I find them a bit gimmicky, so I have disabled them. 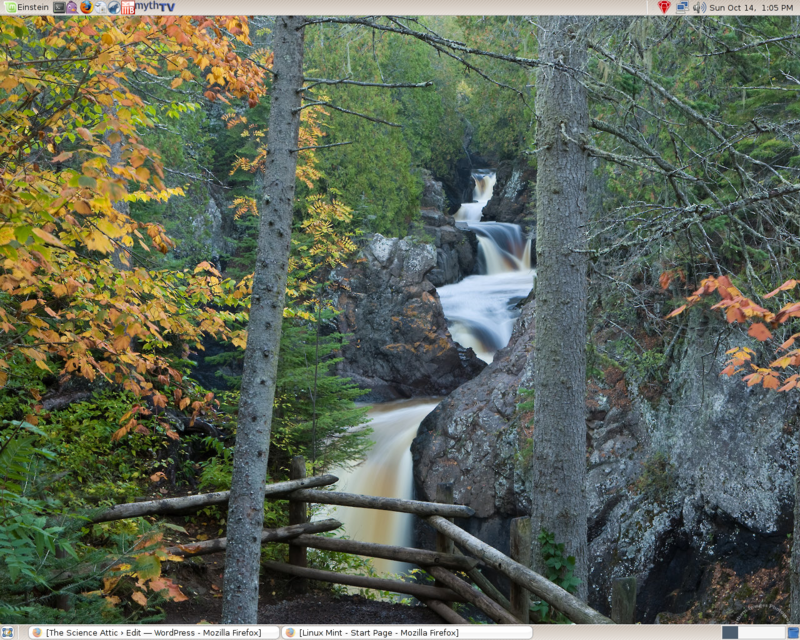 Like any linux I have used, the GUI (whether it be Gnome or KDE) is customizable. I like the Linux Mint Menu, but prefer a more traditional two bar approach when I use Gnome. So I added the second bar, and added the desktop pager, and icons to launch apps, etc. Beryl is included and I had no issues getting it to work properly (the system has an Nvidia 6200 video card). 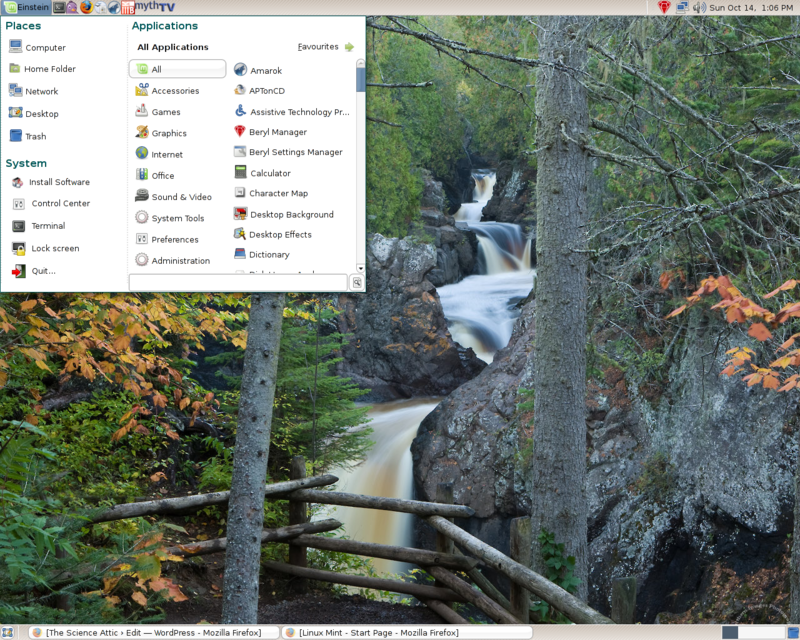 You’ll notice the Linux Mint Menu is labeled “Celena”. All of the Linux Mint releases have a name associated with it. You can easily change this by right clicking on the menu and choose Preferences. This will launch the Gnome config editor to the proper key to change. Change “applet_text” to whatever you wish it to be. In my case, I changed it to “Eintein”, the name of the system (which you specify in the setup). This is a good looking disto, and so far I have had no issues to speak of. If you have an opportunity to install this on a VM or test box, I would definitely give it a look. If you like it, and it works well on your system, perhaps it could be your Linux of choice.